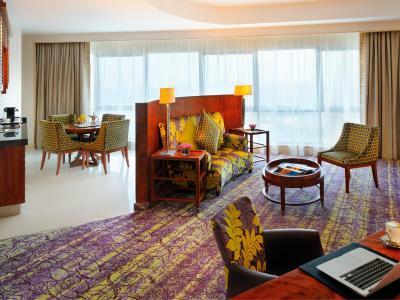 Lock in a great price for Mövenpick Hotel West Bay Doha – rated 8.4 by recent guests! My score is only due to the Great Breakfast and Staff behavior. The staff is really nice and Breakfast was amazing. Location was OK.
Everything was professional since checked in until check out. Staff always helpful and kind. I used all facilities and all are fully serviced up to standard. Very nice location easily found, and a very helpful valet parking. Staff are so friendly and helpful. V good location. Room service available on time! since this is my second stay in the property, i like the view and the friendly staff. I also like breakfast. Everything was excellent. 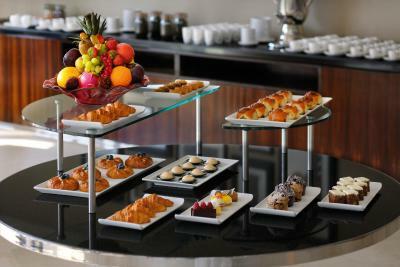 Staff were great, breakfast was buffet and plenty of space to eat and relax. Pick up service for my Uber Taxi was excellent also. 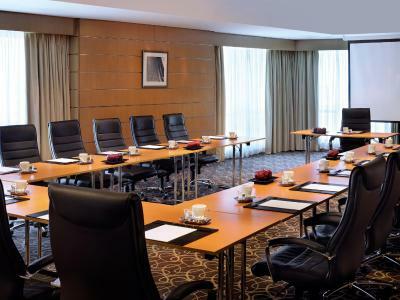 Mövenpick Hotel West Bay Doha This rating is a reflection of how the property compares to the industry standard when it comes to price, facilities and services available. It's based on a self-evaluation by the property. Use this rating to help choose your stay! 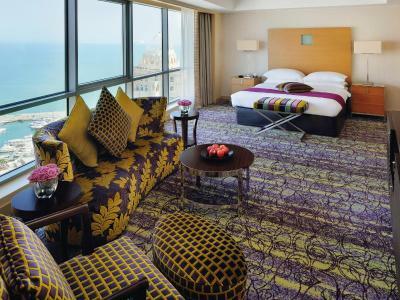 With an ideal location on the Corniche at the prestigious West Bay area, this 5-star deluxe hotel offers spacious rooms, inspired dining options and a luxury spa. The contemporary rooms have flat-screen TVs. 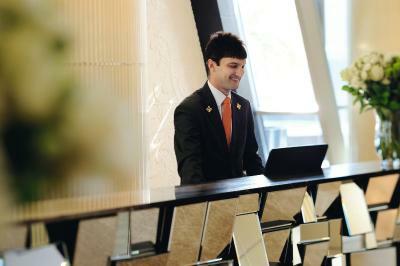 Hamad International Airport is 20 minutes' drive away from the hotel. 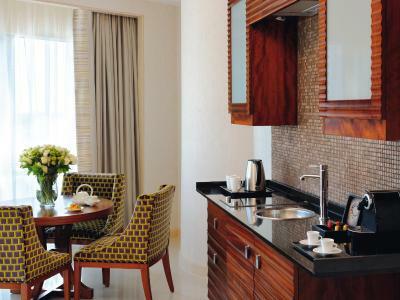 All spacious rooms at Mövenpick Hotel West Bay Doha have a seating area and a kitchenette with tea and coffee making facilities. Each bathroom is equipped with modern bathroom amenities. 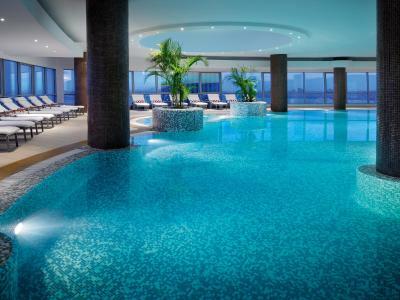 The Mövenpick Hotel West bay Doha is operated using the Green Globe sustainability program preserving natural energy sources, as a role in helping the environment. 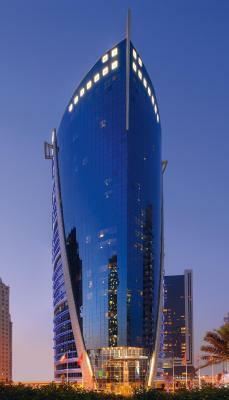 The state-of-the art Bay View Spa overlooks the city and the Arabian Gulf. It features a hot tub and massage therapies. Guests can relax further in the indoor pool and the sauna. 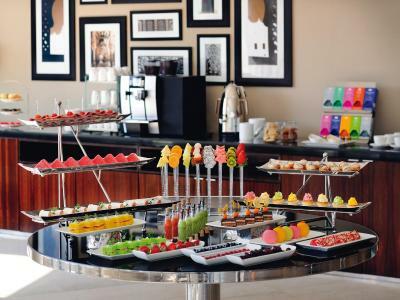 When dining, guests can enjoy breakfast, lunch and dinner buffet options, as well as Friday Family Brunch at ForKnife restaurant. Free parking is available at Mövenpick Hotel West Bay Doha. 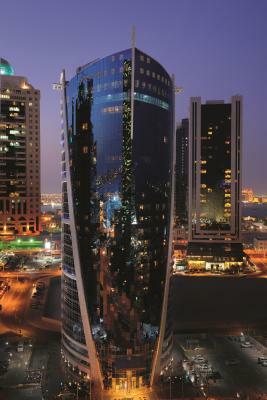 When would you like to stay at Mövenpick Hotel West Bay Doha? Executive King are decorated in warm, neutral tones and comes complete with a writing desk, seating area, high definition LCD TV and full kitchenette. 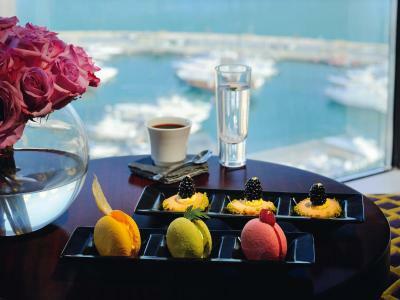 Enjoy the stunning sea view and stay connected with free complimentary Internet access and complimentary breakfast. This room can accommodate a maximum of 2 adults and 1 child in existing bedding. Extra bed at a charge is possible. Late check-out until 16:00 hours is considered upon availability and complimentary airport transfer is available. 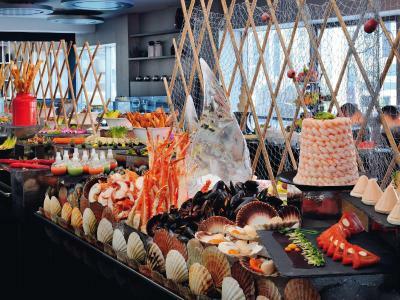 Enjoy a lavish buffet at ForKnife Restaurant and exclusive access to Executive Lounge. On the upper floors and offers panoramic views of the Gulf and the Doha skyline, the 517 ft² Junior Suite King features a kitchenette and a separate dining area. Complimentary internet and a personal espresso machine are also included. This spacious, air-conditioned suite is decorated in warm, neutral tones. 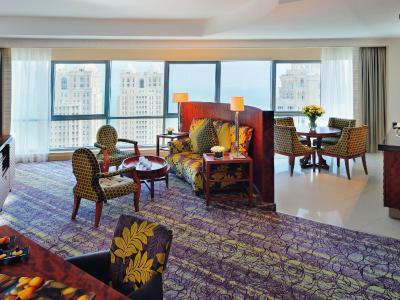 It features panoramic views of the city and the Arabian Gulf, and complimentary internet. It also includes a separate living area with a flat-screen satellite TV. The private bathroom includes bathrobes, slippers, and free toiletries. 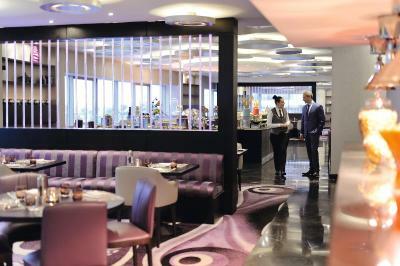 Guests can enjoy complimentary breakfast, complimentary tea and coffee and exclusive access to Executive Lounge. Two interconnecting rooms with a double bed in one and 2 twin beds in the other. A kitchenette, 2 TVs and a complimentary tea/coffee tray are included. This room is decorated in warm, neutral tones and offers a king-size bed as well as a sitting area and work desk. 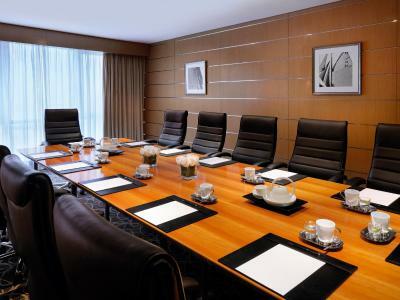 Featuring city views, this room offers a high-tech TV and complimentary WiFi. It has a bathroom that offers a bathtub and luxurious rain shower combination. Tea and coffee making facilities and mini-bar are also provided. 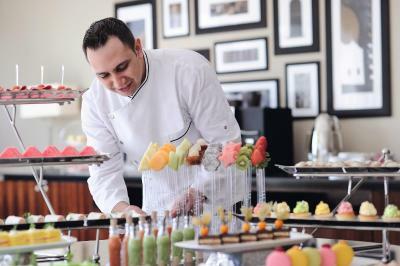 The provision of a kitchenette gives guests the option of eating in their own private space. 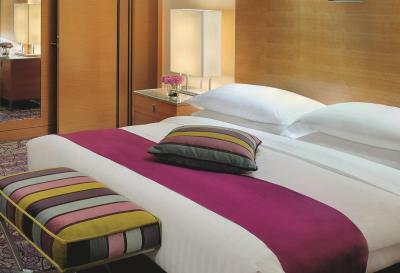 All Deluxe King Rooms have individually controlled air-conditioning. 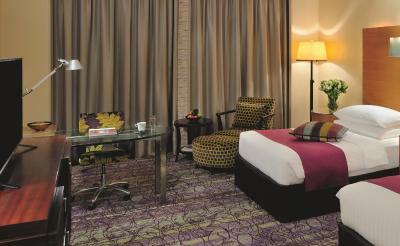 Deluxe King Rooms can accommodate 2 adults and 1 child. Rooms are available for smoking and nonsmoking room. 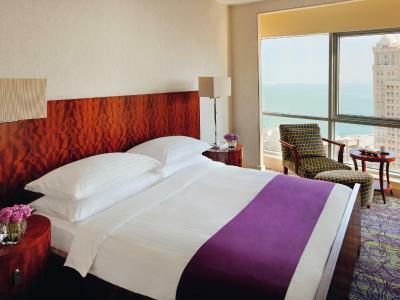 On upper floors with wonderful views of the Gulf, the Panoramic Sea View Rooms promise amazing water views. 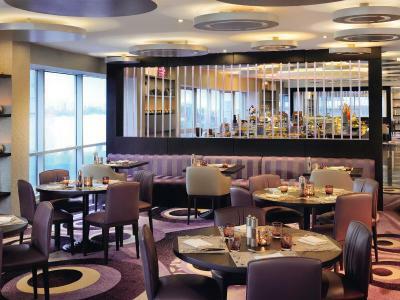 They are spacious and provide a serene setting for a unique experience. Rooms offer a comfortable sitting area, high definition LCD TV, writing desk and complimentary Internet connection, to ensure that you have everything you need to work or simply relax. Tea and coffee are complimentary and the minibar is always at your disposal as well as a kitchenette for your use during your stay. A perfectly furnished bathroom is fitted with a bathtub and rain shower. 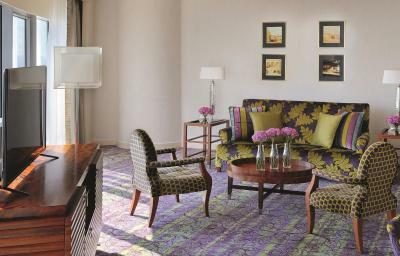 This suite is ideal for guests looking for that next level of exclusivity during their stay. Offering the ultimate in comfort, privacy and convenience, the West Bay Suite comes with a full kitchenette, a dining area and a sitting area, with a separate bedroom. For your comfort, two bathrooms are available. 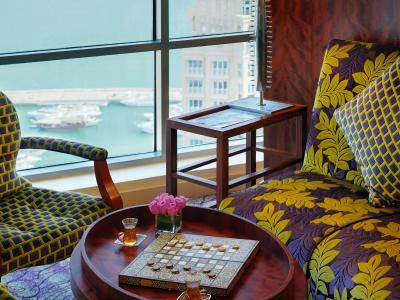 Enjoy complimentary breakfast, complimentary Internet and a personal coffee machine and gazing at beautiful city and Gulf views. Featuring a city view, this air-conditioned room is decorated in warm, neutral tones and offers a sitting area and work desk. It includes free WiFi and a flat-screen TV.The appointed bathroom includes a bathtub and luxurious rain shower combination. Tea and coffee making facilities and mini-bar are also provided. It also includes a kitchenette. Deluxe Twin Rooms can accommodate 2 adults and 1 child. Rooms are available for smoking and nonsmoking room. 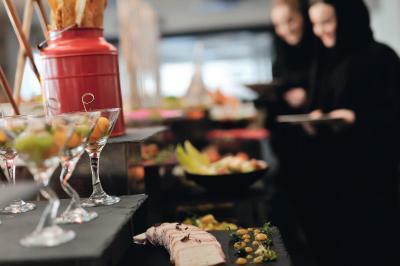 House Rules Mövenpick Hotel West Bay Doha takes special requests – add in the next step! One child under 11 years is charged QAR 100 per person per night in an extra bed. One additional older child or adult is charged QAR 100 per person per night in an extra bed. Mövenpick Hotel West Bay Doha accepts these cards and reserves the right to temporarily hold an amount prior to arrival. Please inform Mövenpick Hotel West Bay Doha of your expected arrival time in advance. You can use the Special Requests box when booking, or contact the property directly using the contact details in your confirmation. Get some proper door stops for interconnecting rooms. Lovely staff, inhouse cafe, awesome bedding and breakfast. did not experience any bad situations. furniture and carpeting a bit dated. Small problem with the shower. It’s on the other side of the bay from the old Souq but close to the beach. Great breakfast and very comfortable bed. We had great views from the 20th floor! I would certainly not consider this as Five-star hotel. 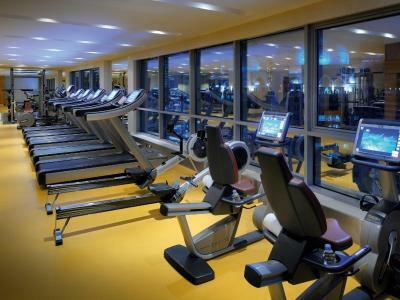 The facilities and aminities they are providing is very common. Nothing great compared to price they are charging. I woukd say they are over priced. I would certainly try to see if I find better option next time. Lobby is a bit messy, as well as the breakfast area. I didn’t like the amenities like shampoo and shower gel, I was expecting better ones in a Movenpick hotel. I have paid for a room that differed from what they gave me. I arrived at 2AM due to flight schedule, and they said they couldn't change me because the hotel was fully booked. They only changed me the next day. Food was terrible. The smell inside the main hall was unpleasant. No alcohol in the hotel.